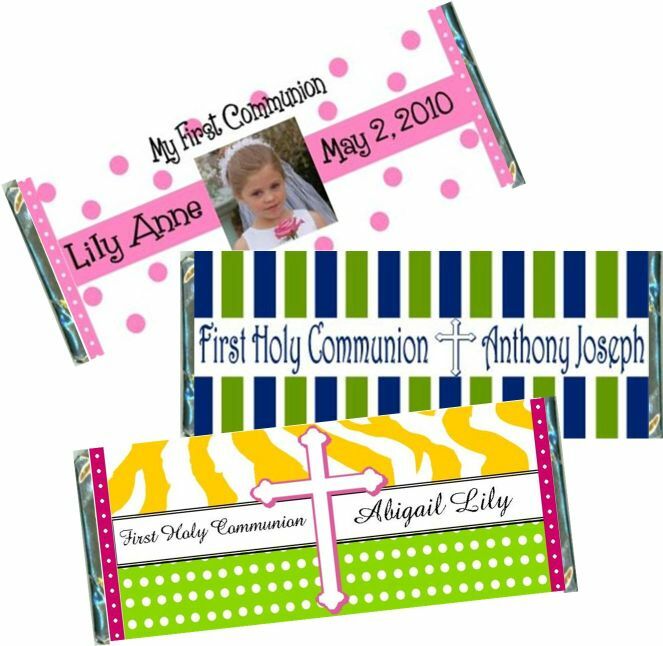 Our First Holy Communion Candy Bar Wrappers and Candy Bar Favors are simply spectacular! We have such a wide variety of designs to choose from. Your First Communion Candy Bars can be trendy, stylish, traditional, religious, festive, fun, or a combination of all! Personalized Communion Chocolate Bars look great at a place setting, on a candy table, or displayed in a pretty basket! If you can't find what your looking for, our designers will work with you to create the perfect Custom Candy Bar Wrapper at no additional cost! We will add a photo to your Candy Bar Wrapper FREE! We will personalized your First Communion Candy Bar Wrapper FREE! 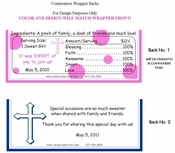 We will custom design a one of a kind Communion Candy Wrapper for you FREE! We also give you the foil sheets FREE! Ordering is easy and stress free, and with a quick turn around time, you'll have your beautiful Communion Favors in no time at all! A First Holy Communion is a very special day in your child's life as well as yours. Why not choose a Party Favor you both will love! A Candy Bar Personalized just for your child. Thank your guests for sharing your special day with a delicious chocolate bar covered in one of our exclusive First Holy Communion Candy Bar Wrapper designs. 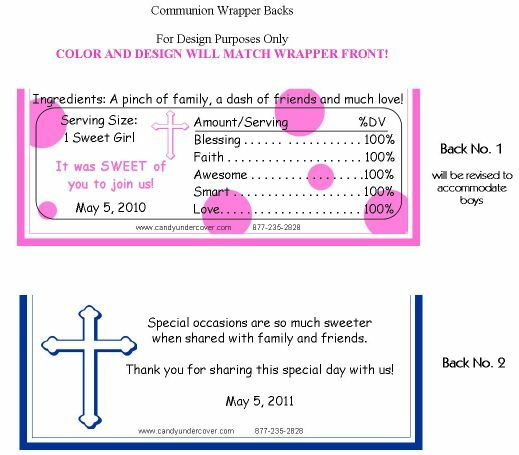 Our Communion Candy Bar Wrappers can also be used for Confirmations! All the wording on our wrappers can be changed to read Confirmation or any other wording you want! Order the CANDY BAR WRAPPERS ONLY. We provide the SILVER FOIL underlay and PERSONALIZED WRAPPERS! *This is a DIY party favor. We do NOT provide the Hershey, Kit Kat, or GODIVA candy bars!! *Our wrapper/foil combo will fit 1.55 oz "Regular" Size Hershey bar, Regular size Kit Kat bar, 4.4 oz. Jumbo Hershey bar, or 1.5 oz. GODIVA candy bar! *Assembly is required by customer *Easy to follow instructions will be included with your candy bar wrapper order. To sum it up: YOU buy the chocolate bars, YOU wrap the candy bars with foil sheets provided, then wrap the custom design personalized wrapper. Order the fully WRAPPED CANDY BARS. We will do all the work for you! Your First Holy Communion favors will arrive to you all wrapped and ready to go! You will receive an email PROOF of your wrapper prior to printing.